A Round of Words in 80 days is wrapping up today. I am very thankful to Kait Nolan for creating the writing challenge. It encouraged me to set writing goals and to stick with them. Unfortunately my eyes were bigger than my stomach and I didn't accomplish as much this year as I wanted too. At the beginning of the year, I had planned on finishing Red Thief, editing another story and getting it ready to query and take a writing course. I set a goal of writing 500 words a day which ended up not being a bright move for me because I didn't finish my first draft of Red Thief until September. Well, I do have finishing my Bachelor's Degree as a good excuse because it did involve a lot of writing. Anyway, it gave me two months to do other things and then I jumped right back into the Nanowrimo pond with Blue Steel. Since Nano I have kept up the daily writing of 1667 words and the story is progressing nicely. I hope to have the first draft done by the end of the year. I'll have some nifty new goals to work on at the beginning of the year. For the past month or two, I spent a lot more time writing and a lot less time online. I hope to get back to visiting everyone on a regular basis again soon, soon, soon. I miss my blogging buds. 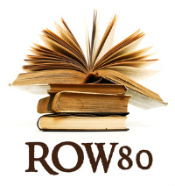 A side benefit of ROW80 was being involved with a wonderful community of writers, making new friends, discovering some interesting books and learning alot from everyone. Getting a look into the writing life of another writer is always enlightening. How did everyone else do with their goals. Go see here. Congrats. You've been working really hard. I didn't hit all my goals either but I learned a lot. Next year, I'll do even better. Adjusting our goals is just one of the beautiful things about this challenge. All in all it sounds like you did well. I'll see you in 2012. Hope you have a wonderful holiday. I love that: "my eyes were bigger than my stomach." Look at what you accomplished! My goodness, so much writing. And I love how we learn from our goal missteps -- you'll probably have a better idea of what to do in the next round -- see you there! You do have a great excuse. Still, you did well with this challenge. :) Speaking of challenges, I was looking around and saw the 52 books in 52 weeks. Are you hosting that challenge?